As the new Beauty and the Beast—starring Emma Watson and Dan Stevens—readies for its big-screen premiere, the tale as old as time is ready to enchant a new generation of audiences. Before you check out the live-action update, here are a few facts about the 1991 Disney classic. 1. WALT DISNEY CONSIDERED REMAKING THE FAIRY TALE AS FAR BACK AS THE 1930S. Walt Disney liked to take his time mulling things over, and while he was pondering Beauty and the Beast, a live-action version of the movie was released by French filmmaker Jean Cocteau. Perhaps not wanting to release an animated version of a movie that had just been released, Disney tabled the idea. 2. A NON-MUSICAL VERSION WAS COMMISSIONED IN THE LATE 1980S. In the late '80s, Disney hired British animator Roger Purdum to direct a non-musical version of Beauty and the Beast, with Linda Woolverton writing the script. But the company wasn't happy with the result of 10 weeks of storyboarding (which you can see here)—the story was too dark and depressing. "In the middle of our process, The Little Mermaid premiered, and that changed everything," Woolverton told the Los Angeles Times. "[T]he concept of the musical, the Broadway musical brought to animation by Howard Ashman and Alan Menken. So I was flown to Disney in Florida to meet with Howard. Howard and I just clicked. ... In a hotel room in Fishkill, New York, Howard and I pretty much conjured up this version of Beauty and the Beast. Howard and I never clashed. I was his student. He taught me everything I know about musicals." 3. JACKIE CHAN CONTRIBUTED TO AN INTERNATIONAL VERSION. 4. "HUMAN AGAIN" WAS CUT FROM THE ORIGINAL MOVIE. 5. THREE OF ITS TUNES EARNED "BEST ORIGINAL SONG" OSCAR NOMINATIONS. 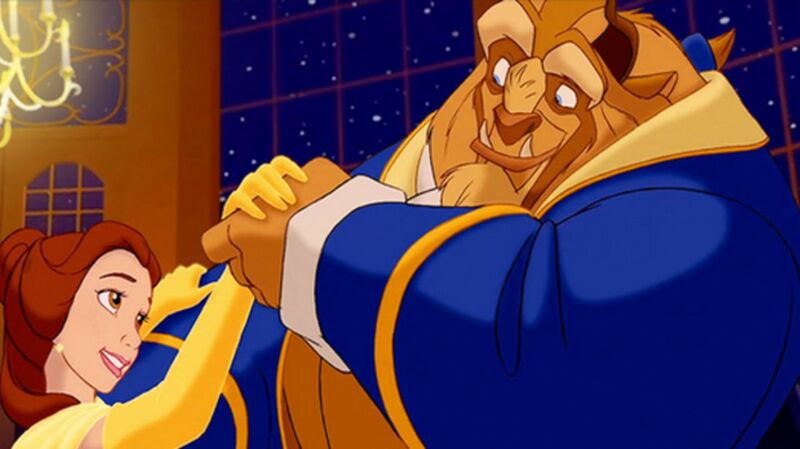 Many people remember that the title song from Beauty and the Beast took home the “Best Original Song” Oscar in 1992, but it was just one of three songs nominated from the movie. But “Belle,” the opening song, and “Be Our Guest” were also up for an Oscar. Must have been rough to be the writers of the other two songs in that category: “When You’re Alone” from Hook and “(Everything I Do) I Do It For You” from Robin Hood: Prince of Thieves. 6. THE CO-DIRECTOR STARTED HIS CAREER DRAWING CARICATURES. Co-director Kirk Wise started his career drawing caricatures for tourists—but not Disney tourists. While attending art school, Wise made extra money by working at Universal Studios. 7. THE BEAST IS A MASH-UP OF VARIOUS ANIMALS. 8. ONE ANIMATOR WISHED THAT THE BEAST STAYED A BEAST. 9. ANGELA LANSBURY SAID THE DEMO MUSIC WAS A LITTLE TOO ROCK 'N' ROLL. When Angela Lansbury heard the demo of "Beauty and the Beast," it was "kind of a rock song," she told The Huffington Post. "I told them, 'This is a sweet message, but this really isn't my style. Are you sure you want me to do this?' They told me to sing the song the way I envisioned it, so that's what I did. I created it the way a little English teapot would sing the song." Producer Don Hahn said that Lansbury "went into the booth and sang 'Beauty and the Beast' from beginning to end and just nailed it. We picked up a couple of lines here and there, but essentially that one take is what we used for the movie." 10. THERE'S A SLY REFERENCE TO DISNEYLAND. You have to squint to see it, but when Maurice gets lost in the woods toward the beginning of the movie, one of the road signs he finds points the way toward Anaheim—which is home to Disneyland. 11. THE POSTER WAS DESIGNED BY A MASTER OF THE ART. John Alvin, the artist who created Beauty and the Beast's iconic movie poster, also designed the posters for some other films you might be familiar with, including E.T. : The Extra-Terrestrial, Gremlins, The Lion King, The Color Purple, and Blazing Saddles. 12. BELLE MADE A CAMEO IN THE HUNCHBACK OF NOTRE DAME. Fittingly, she has her nose in a book. You can also see brief appearances by Pumbaa from The Lion King and Magic Carpet from Aladdin. It’s hard to spot Pumbaa—and tragic, as he appears to have been slaughtered—but both directors have confirmed all three cameos. 13. BELLE ISN’T THE ONLY BEAUTY AND THE BEAST CHARACTER THAT POPS UP IN OTHER MOVIES. The Beast can momentarily be seen in Aladdin as one of the animal stacking toys the Sultan plays with. 14. THERE'S A NON-MUSICAL VERSION. An earlier version of the movie contained no music. It also gave Belle a little sister named Clarice and a cat named Charley. 15. AUDIENCES WERE SUPPOSED TO SEE THE SEQUENCE WHERE THE YOUNG PRINCE IS TURNED INTO THE BEAST.